Tamiya TT02 / TT01 front Camber, Caster and roll center mod. For a while I have been after a solution that would allow me to adjust front camber on the TT02 without having to use the heavy aluminium arms. The TT02 has ball pivot suspension, at the front which means that I couldn't simply do the same type of modification that I did with my rear camber conversion, as the front upright would move around all of the time as the upper arm would not be fixed. 2 servo posts, (Most will work as long as they are the Tower type), or a RcRacer FontCamber Spacer. 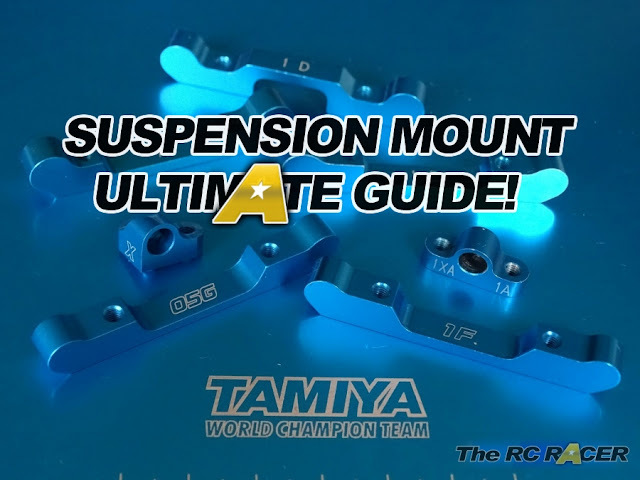 Tamiya (53539) 5.5 mm spacers. These are used to adjust the roll center or caster. First up I assembled the Servo post, the 5mm adjuster and turnbuckle. I then placed the Tower flanges into the front suspension Tower and used a 16mm screw to screw into the upper hole on the servo mount. 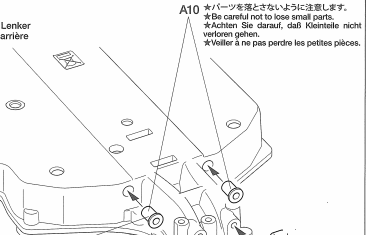 You want to screw them in so the arms do not move, but then you just have to gently loosen the screws until the arms move, you do not want the arms to be to loose or the upper arms will move. I used plastic servo mounts as the screws dig into them, you can use metal posts, but you will probably want to use threadlock. You then need to get the plastic front uprights and cut 6mm off the top shaft. I have experimented a bit with different lengths, and the best result is to cut off 6mm to get a good roll center. I then also use shims to raise or lower the roll center. 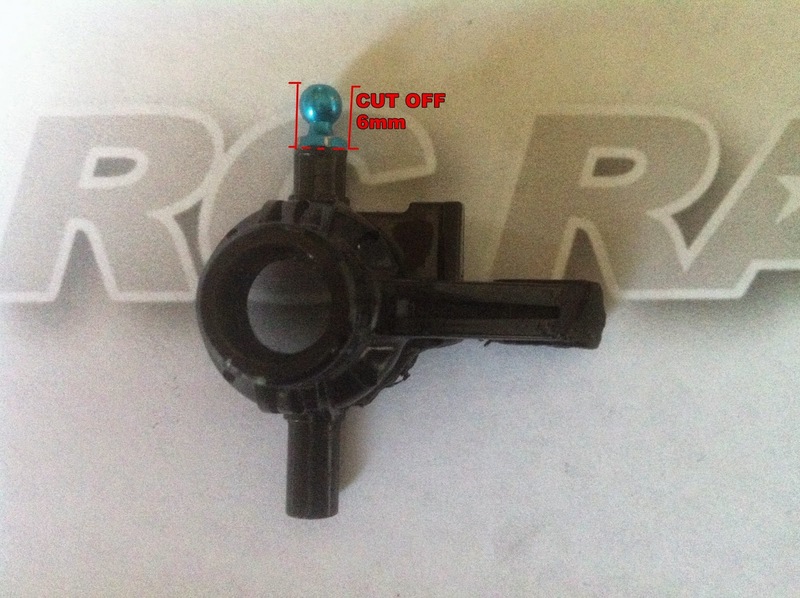 To raise the roll center you just need to add shims under the ball connector, to lower it, then just remove them. This setting (6mm cut) is a good starting point, but it is quite neautral, if you want more steering then you can raise the roll center. Front Roll Center Overview: The higher the front roll center is, it will make the initial turn in more responsive, however mid corner steering may be reduced. The lower the front roll center, the softer initial steering response is but you will may get more corner steering (Although there are other things that can dramatically effect mid corner steering such as caster and droop). Here you can see that I also filed off the lower part of the upright to get more steering throw. Here is the finished upright, You want to ensure that you have cut them to the same length. If you are just a few 1/10th of a mm out, just put some small shims to ensure they are both the same height otherwise your roll centre will be wonky. The full front upright ready to be fitted in the car (7mm wheel hex's for more track width). The upright is fitted on the car, the upper arms are connected and I just set the camber for the front (1.5 degrees). This mod allows you to adjust the front caster. The base TT02 has 2-3 degrees of caster. The part I use gives 6 degrees of caster. This ensures that the car centers quicker on the straights, and it also much more stable mid corner. You can adjust the caster by adding shims between the servo mount and the flange, or just swapping to a servo mount that is a different width. So the car is all ready, the upper arms are true, there is no wobble and the front camber is set to 1.5 degrees and the rear is set to 2 degrees. The car was ready and it pulled away instantly the steering felt good, I was really happy with the car. I started to push it and I was holding onto the same lap as a friend and their TBEvo 6. I had got my gearing slightly wrong and I was a little slow on the straight, but the car was quick on the infield. The mod has worked really well. It's solid, and has survived a few hard collisions, its also remained precise (I checked the settings again on the set-up station). With the other modifications made on the TT02 its become a pretty solid race car :) There is more to gain from the car, but that will be in the form of set-up only from this point. I will post a setting sheet later. Tamiya DB01 Steering posts also make good flanges for the suspension, plus they're threaded... and blue... I've used them with Eagle racing upper mounts and shock towers to allow me to mount Yokomo upper arms for a rock solid camber and caster setup... but stripped everything back when my TT02 went into rally mode. a positive 1.5 up font & negative 2.0 in rear....? ?